Height Adjustable Handle: Suitable for users of all heights. The non-latex comfort grips are height adjustable from 30” to 43”. Height & Width Adjustable Knee Pads: Can be quickly adjusted to comfortably suit virtually any user for optimal support. 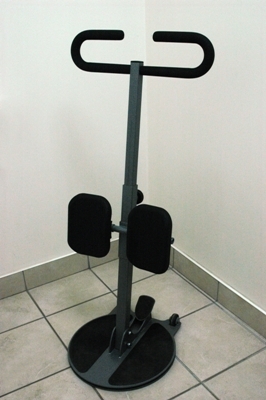 Height: 5” to 25” Width: 9” to 13” from center to center. Quick Lock Brake Pedal: Simply step on the brake pedal to engage the locking mechanism and to prevent the disc from rotating. Ultra-Smooth Transfer Disc: High quality bearings create a consistent and level weight-bearing surface, for a smooth safe transfer. Anti-Slip Foot Pads: Ensure years of rigorous use. Portable: Simply tilt and roll for convenient portability. In the upright transfer position the wheels will automatically disengage from the floor.